As you may know, one of my favorite cookies in the world are chocolate chip. I am always changing the recipe up to give it a little more umph and I have to admit today’s chocolate chip cookie recipe just rocks! If you like spice and heat you will love these ooey, gooey sweet cookies that have a major punch of heat. Let me introduce to you my newest cookie to the collection; Jalapeno Chocolate Chip Cookies. Your probably wondering why jalapenos? Well I have so many of them from the garden that I just don’t know what to do with them all. Until my tomatoes come in season, you’re going to be getting lots of pepper recipes. So what’s up with jalapenos in cookies? Well, glad you asked! 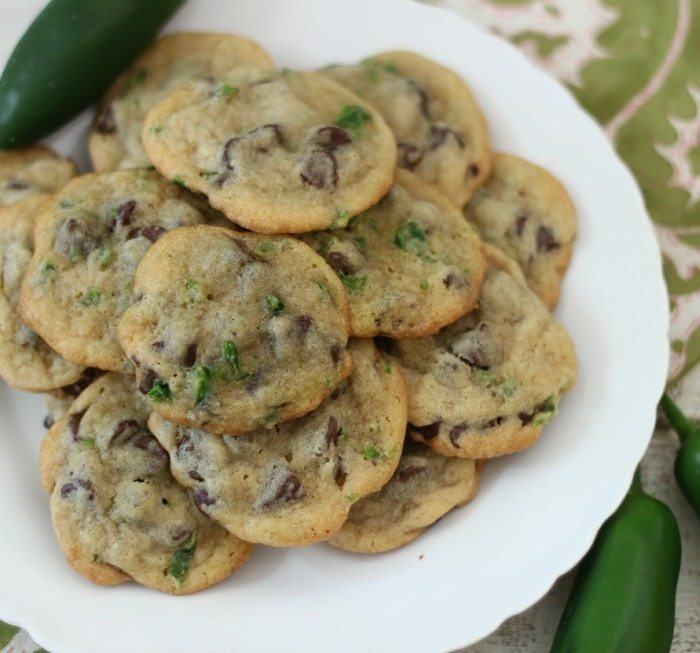 Have you ever had jalapeno peppers and chocolate together? It is a crazy combination that goes so well together. The little bit of heat from the peppers, really intensifies the chocolate. The cookies do have some heat, but not enough to burn. It just adds a new level of flavor to your cookies. Trust me, if you like jalapenos, you should give this a try. Amazing! 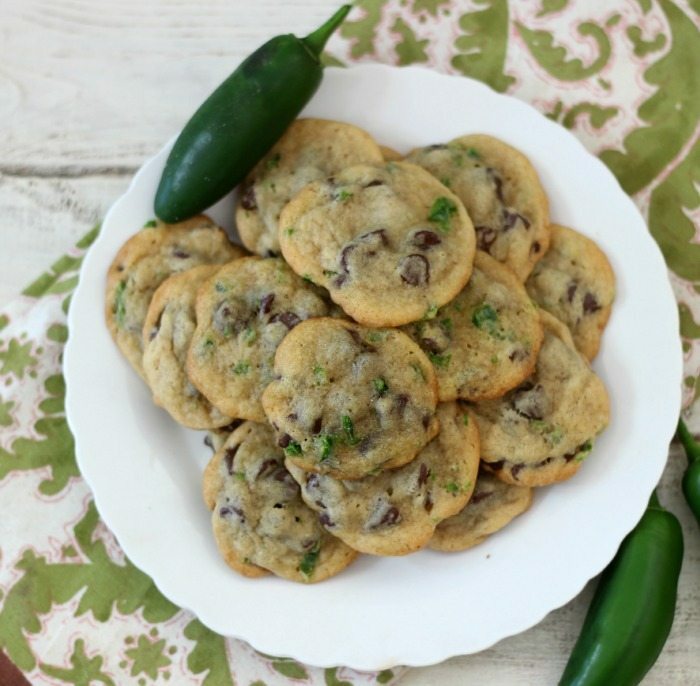 A sweet ooey, gooey chocolate chip cookie that has a punch of heat from freshly diced jalapeno peppers. In a medium bowl, sift together flour, baking soda and salt; set a side. In a large bowl, add butter, granulated sugar, brown sugar and beat until creamy. Beat in one egg until combined. Beat in vanilla until combined. Slowly add flour mixture until well combined. Stir in chocolate chips and jalapeno. Take about heaping teaspoon size of dough and place 2" apart on prepared baking sheet. Bake in oven for 8 - 10 minutes, just until lightly browned around the edges. Let cool on baking pan for 2 minutes and place on a rack to cool completely. Store in an airtight container for up to a week or freeze for up to 3 months. I am loving my new spicy cookies! Just be sure to take the seeds and the membrane out of the jalapenos. I can only imagine how hot these would be if you left the seeds in them. After all, that is where the heat comes from. 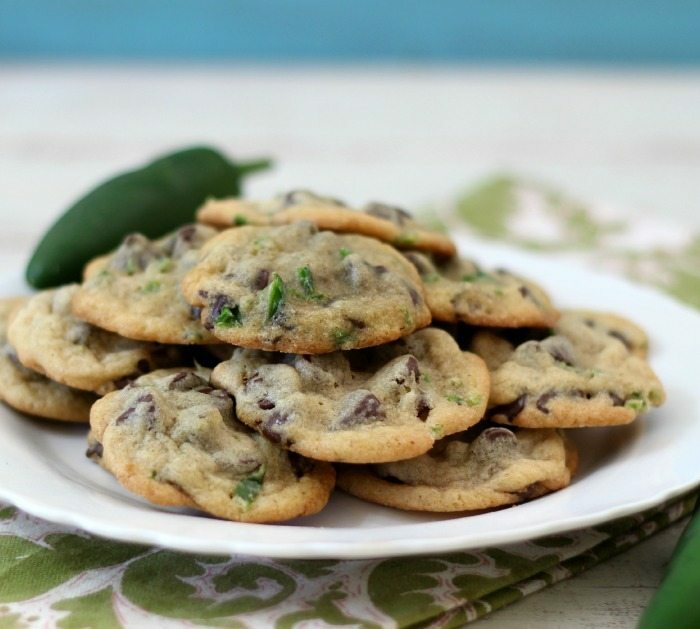 So next time you pick up some fresh jalapenos, save some and add them in your favorite chocolate chip cookie recipe. This will be quite a surprise for those who taste it. Sounds delicious! I will just have to try these. This recipe is like the perfect balance of craziness and totally making sense and I mean that in a good way! I’m totally trying this! I think we can safely call this recipe Outside The Box! Great job! Thank you so much! I had fun with this recipe! It’s a crazy cookie. I’ll be honest, not everyone liked them, but at my Husbands work, he said they all got eaten and was asked for the recipe. I’ve tried jalapenos in a lot of things but, not cookies. This is going on my must try list! i am so excited to try these! i am very interested in doing chocolate with a ‘savory’ flair (i know these are still a dessert, but my brain associates jalapeno with savory dishes! ), these look great! Hi, do you think I could use frozen jalapenos in this? Or do they have to be fresh? Thanks! Hi Katherine, Honestly, I am not sure. I used fresh. But frozen may work. I would say give it a try. Frozen jalapenos work just as well as fresh in any recipe you cook. I use them all the time. I made something similar this weekend- and I agree with you- they are unique but totally delish! my hubby and his buddy LOVED them! Candied jalapeños sound even better..perhaps? Wow…they exist!! 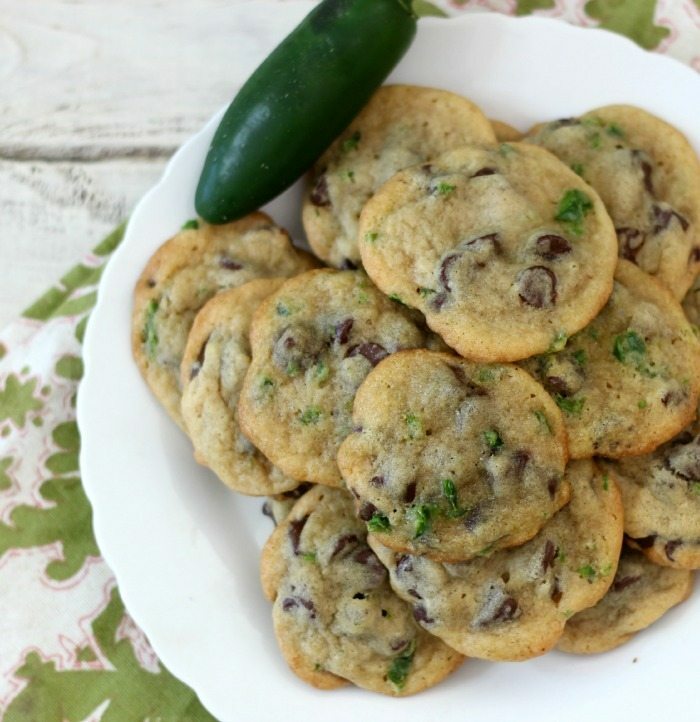 LOL I was just looking for a jalapeno cookie recipe and ran across these. Definitely will try. My sons make chocolate chip cookies with crushed Altoids! They are great! !